Mulgrew thanks us for coming. Asks everyone to look at people on floor 19. Makes jokes I don’t understand. Moment of silence for members who’ve passed. Says he goes to White House and ends up in fights. Says he listens to well-educated people who’ve never been in classrooms give advice. Says foundations and organizations mentioned we were overtesting and he was shocked. Says they spoke of developing whole child, in sarcastic tone. Says they wanted to know why schools don’t develop children socially and emotionally, but next group wanted grit and determination. He asked how we would test that. Speaks of lack of accountability and reality on part of these overpaid people. Mulgrew discovers Janella is on 19 and begins to make jokes about it. Finds her on one and has small conversation about whether or not she enjoyed DC. Mentions how politics were all against us, and how we had to deal with Bloomberg. Mentions complete hypocrisy on the part of nameless people he met with in DC. Mentions public believes in union more than mayor or governor. Says this has penetrated to DC, and White House. Mentions Hillary Clinton’s charter school comments, says White House was disappointed in them. Mulgrew says he told them they were disappointed pols told truth. He says what we’re doing is working. He says it’s coinciding with Cuomo looking at Common Core. Says we’ve placed people on that commission. Says negative CCSS comments help commission. Says commission may make recommendations before next DA, that we will agree with many, and that this is shocking. Says they are still only recommendations for Board of Regents. Says if we want them we will have to push hard. Says we got rid of parts of law we did not like last year. Says it’s significant that people are talking about what’s happening in NY. Says when they use words “developmentally appropriate” and “scaffolding” good things are happening. Says he feels it in his gut, and if we support it, there we be an all out media blitz. Wonders where our opponents will be if we win this. Says our opponents will fight us. We are coordinating with other unions nationally. Was agreed that national push will start next week. Says he’s working with Attorney General, who’s been talking about filing amicus brief with other states. Buffalo—got receivership. Says remember last year “everyone was jumping up and down.” Says we should be calm but receivership is most problematic part. We negotiated agreement easily with chancellor and mayor. Buffalo did not. Says it is problematic but will not use curse word instead because he saw him mother last night. Tells story about his mother and a bobblehead. Discusses their talk about the Pope. Says Buffalo schools under receivership had their collective bargaining rights thrown out. Says we’re lucky we aren’t dealing with Bloomberg. Says he knows Jets are playing Bills tonight. Says what the commissioner did was wrong. Says he knows there will probably be a resolution about it. Asks where the Taylor Law is now that a union’s collective bargaining rights were thrown out. Part 154—we sent a letter specifically saying don’t do this, told them why. Says Bloomberg dismantled ESL services. Says state passed a regulation that is physically impossible to comply with. Says he’s talking to right people in Albany, to SED. Says a lot of schools that never mentioned ESL are now talking to him and he will send a letter. Says we have proof it is a disaster. Suggests we not go crazy, says we must ask how to get it done, because it cannot be done. Says tell principal to chill, and if they don’t call UFT. Eva Moskowitz upset with UFT. Not used to getting bad press. Talks about how Eva suspends kids until they leave, how she denied it but was caught. Mentions she called it anomaly, but reporters found proof otherwise. She now says she was creating orderly schools. She now says she is not doing what public schools do, which she always did. Says she failed to attend her own press conference to avoid awkwardness, having attacked Hazel Dukes. Amy Arundell says anyone in kindergarten with 26 and above elementary gets one prep extra, 27 or more will get additional help half day, 28 gets additional help full day. Mulgrew says this will discourage oversized classes. Mulgrew says we have “much less” oversized classes. Mulgrew says we gave awards for union action in school at last gala event, Teacher Union Day. Asks reps of those schools to stand. Mulgrew ends report at 4:54. CL—What are we doing for teachers who still have abusive principals? Mulgrew—doesn’t matter who mayor, chancellor is—we will always have abusive principals, though they swear otherwise. Says we will start principal in need of improvement campaign when necessary. Speaks of building chapters, chapter advocacy program, which he says is very successful. Says when there’s no consultation, no meetings, principal wins war. Says we can fight when people are afraid to be on consultation committee. Says principals deny abuse, but we place pressure from all levels. Delegate—What’s the difference between PROSE school and other UFT schools? Mulgrew says PROSE is 5 year SBO that may include changes in state, city and chancellor’s regs. Says we have 126 total, Started with evolution, now focuses more on schedules. Says we have three schools where teachers have four day work weeks. Kids attend five days. 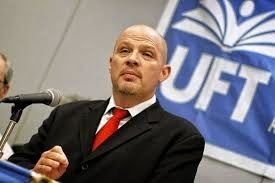 Says you have to have 65% of UFT members vote yes. Says there is PROSE team. Says PROSE schools together would make second or third largest district. CL—Question on Campbell Brown lawsuit. What happens after dismissal is rejected? We appeal. Says NY Attorney General on our side, wants to protect tenure. Delegate—Many members have tried to offer feedback on CCSS, find survey tedious, complicated, unrealistic. Mulgrew agrees, says NYSUT is working on it. Differentiates it from Cuomo’s commission. Says he’s brought it to SED. CL—Erasmus Hall Campus—rumor metal detectors are being taken out. Worried about new scanning protocols. Says there were five weapons seizures he knows about. Says he was told without metal detectors teachers can’t be protected. Mulgrew says people are upset when metal detectors arrive, and when they’re removed. Says DOE trying to make process for placement and/ or removal of metal detectors. Says detectors should not automatically remain forever, and we need a process. Mentions mobile detectors. CL—Question about ATRs—what can we do for them in buildings? Any suggestions on involving them? Mulgrew says as president and teacher he hopes it happens in every school but some communities are not open or cordial. Says number of ATRs is decreasing, and there’s never not going to be an ATR. Says Bloomberg tried to use it to make us at will employees. Mulgrew hopes they are treated as staff members and invited to all events. PS 32, district 25—MOSL may have built in prejudice. When people decides fate of who they work with, it can be chosen to hurt people who are disliked. Mulgrew says we have members who have asked for more objective measures, He says that makes them standardized and leads to tests. Says most objective measure we have is state standardized test, but what they’ve done with tests is wrong. Do we want to go back to having entire evaluation based on administrator’s judgment? Speaks of school where members were rated zero by principal. Says they were overturned because they were rated E or HE on test scores. Mulgrew says tests should be used to give us info to plan how to help students. Says some people say they want no tests and others say tests are all they trust. Says it’s a real discussion. Says we will not stand for use of standardized tests for sole purpose of evaluating teachers, and that’s what we’re doing right now. Says scantron tests are objective, but worst tests you can give child. Mulgrew says we have 700 ineffective ratings, and that’s it. Says the Post will attack us for that. Criticizes old system as based only on principal judgment. Says we have to change definition of what student learning is, that it’s not just a test. Says it’s not a perfect world and he wishes he could make it so. Questioner mentions Georgia, asks if schools were reevaluated. Mulgrew says teachers in NY being evaluated, teachers who taught self-contained L students. Mindy Rosier—Mulgrew says she does wonderful work on social media—raises resolution in opposition to receivership. Mulgrew says we need two thirds motion to put it on agenda. Motion is being distributed. Mulgrew asks parliamentarian if makers of similar resolutions can figure out how to bring them together. Asks for motion that two makers meet to create single resolution. So moved. Sterling Robeson—Friedrichs—resolves we continue to educate our members. Says we know who backers are and why they are doing this. Urges we support this. Seconded. Mulgrew opens floor to debate. Marjorie Stamberg—proposes additional resolve—because Supreme Court not elected, and not subject to legislation, that we, the UFT urge massive mobilization of union power to oppose Friedrichs. Motivates talking about Wisconsin, where Madison Public Employees moved for general strike. Says on eve of strike, AFL-CIO moved against and urged recall. Says this is what we are facing here, and Republicans and Democrats won’t help. Open for debate. Dave Pecoraro—moves to call all questions before the house. Mulgrew—no one wants a debate. Mulgrew read res. Resolve and motion pass. Mulgrew says we have 7 minutes for motions. Mindy Rosier—resolution withdrawn for this month—will collaborate and bring it next month. Rich Mantel, middle school VP—Mulgrew says no debate. Just two thirds for or against. Asks for investigation into conditions and high rates of suspension in Moskowitz schools. Enthusiastically passed, seemingly by everyone. Mulgrew moves to close resolution period. George Altomare—Wants to pay tribute to 1960 strikers. Says it’s amazing right of collective bargaining before us again, after we won it in 1960. Says we cannot accept this. Says everyone here has had a supervisor try to take away dignity. Says each of us has a genesis, as does union. Speaks of poverty of teachers then, 50 years ago. Says he considered career change. Speaks of Shanker and David Selden. Speaks about strike. Says heroic efforts, brotherhood and unity were forever, that all teachers would win, and that we did. Dave Pecoraro—calls the question asks for acclamation. Resolution passed unanimously. Tom Brown—supports resolution in response to risk of climate change to TRS. Says UFT should have expert advisors to mitigate risk. Jonathan Halabi—strongly supports. Says it’s not just stocks but our world. Urges quick movement. Question called, seconded, no one wants to speak against. Motion passes. Mulgrew says we no longer have any investments in hedge funds, to applause. Janella Hinds—speaks to support Chicago Dyett HS Coalition. Resolves to support their activists. Seconded. Mulgrew calls for debate. Question called. Resolution unanimously passed. Woman—not introduced—was Evelyn de Jesus, I now think, moves we support NYC initiative to ensure all students receive literacy Seconded. Opens debate. Michael Freeman CL, teaches in programs where literacy is problem. Says it’s very important. Dave Pecoraro, calls question. Mulgrew asks for someone to speak against. Constance Bensen, DR, says we need to include ATRs who are literacy teachers. Mulgrew asks if she wishes to make an amendment. Says she would like to include concern about teachers who have literacy licenses. Mulgrew says since she hasn’t got an amendment ready, he asks maker of motion to figure out how to include. Mulgrew says he’s trying to be kinder and gentler, but will lose it eventually. Debate on this resolution suspended. Sterling Robeson—speaks in support of computer science for all. Wants to ensure all students have access. Says it opens career pathways. Wants to support mayor’s efforts. Seconded. Mulgrew opens debate. Speaker—wants adult education students included in resolution. Mulgrew says it is idea, not amendment. Works to include speakers suggestion. Mulgrew says if it isn’t grammatical he will fix it, that he is an English teacher. Nina Triblle—moves to call question. Resolution passes as amended. Evelyn de Jesus returns, has added amendment. CL—clear distinction between certification and license. Mulgrew says it will say licensed and/ or certified. Seconded. Jonathan Halabi—Was it the intention to leave out specific mention of ATRs? Ruled out of order by Mulgrew. Says he will only be nice so far and we can’t have anarchy. Mulgrew tells people who wish to speak we are out of time, that we have to do raffles and other stuff. Dave Pecoraro, moves we extend three minutes to discuss something. Did not hear what. Passes by few who’ve voted. Moskowitz resolution—Eva nags kids to leave her school. Says she does not educate all students, but we do and gladly. Urge you to urge moratorium on new Moskowitz schools and investigation into her practices.